LiPo batteries are also known as lithium-ion polymer batteries. These kind of batteries are rechargeable or secondary cell batteries. They are commonly utilized in phones, but can also be used in radio-controlled planes and other smaller electronics. These batteries may also be used someday to power electric cars. Cold weather affects lipos, like other batteries, you will probably capacity to be down, and therefore duration to be down. If your model is set up to direct cooling air over the lipos in the summer then it'll supercool them in the winter time, unless you make a change. What I do is to put aluminium tape over the inlet ducts that are there to provide that cooling air. The Lipos themselves sit in a Liposack, with a number of chemical handwarmers to keep the worst of the chill off. One of those will give about 30 minutes of decent heat and so four of them last about as long as I want to be out in the very low temperatures. On returning home the crystallised chemical handwarmers are warmed up in a pan of boiling water up and they then revert to their liquid state for the next time . 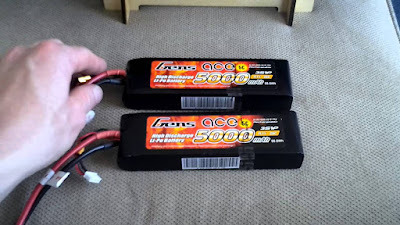 There is a way to get more performance out of a LiPo battery; optimize the Starting Temperature. 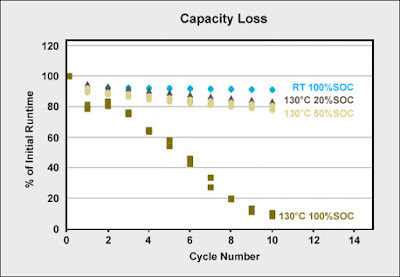 LiPo batteries have an "ideal output temperature". The internal resistance is at its lowest when they're ran with a starting temperature of around 100°F (38°C). A pack at a temperature of less than 50°F (10°C) (very cold pack) can show noticeably poorer performance until it warms up with use. In the winter time or in cold climates, it's best to store packs in a heated indoor living space. For outdoor use in cold climates, you should pre-warm your packs to 90-100°F (32-38°C) before using them. But remember, 140°F (60°C) is the maximum safe temperature, and the pack's temperature will increase when it's used, so be careful not to pre-warm the pack up too much. There are a couple effective ways to do this. The most effective is to find a square heating pad that you can place in your battery bag at the bottom. The only issue here is you will need a power source, not always a choice when out on location. Disclaimer: you must make sure to attach the sensor to one of the pads so they don't run on full power not stop. To do this, just poke two small holes through one of the pads and zip tie the sensor to it so it's secure.This will help keep your batteries warm while out in weather normally too cold for Lipo batteries. Now available from Genstattu, a collection of high capacity, high drain, hard case LiPo batteries specially designed for use in RC cars and models where extreme power and rugged reliability is a must. With discharge rates of 90-100C, capacities ranging from 4800-6000mAh and in a range of configurations the Extreme Track LiPo range comes as standard with Overlander's unbeatable quality, true extreme power and excellent value for money. Available now; a 4800mAh 5s lipo battery Shorty pack, a 5800mAh 2S 7.4v 90C Saddle pack, and a 6000mAh 1S 3.7v 100C, all provided with tubes and necessary cabling! This will help keep your batteries warm while out in weather normally too cold for Lipo batteries. Good luck, respond to the post with any questions!